Though apparently thwarted in its efforts to justify action against Syria, the US is likely to continue looking for cracks in the wall of opposition and will exploit any opportunity to act, relying on its well established impunity. Noam Chomsky, Hegemony or Survival, 2003. In 2003 Noam Chomsky was one of those who embraced the idea that there are two superpowers in the world – the United States and world public opinion (WPO). Clearly it was the US that won the fight in 2003, but there is a sense that things may be different at this time as the two superpowers end Round 1 of a rematch. Unfortunately a sense of difference is all that there is. In matters of substance, there is nothing which we should really take as comforting, and nothing that we can really point to that will ensure a different outcome. One of the most serious problems is the WPO can only block US moves and has no effective way of fighting back. Even if the US finds its fanciest and most energetic combination blocked and foiled it can just dance around jabbing, waiting for an opening to land a serious blow. It only takes one blow for the US to be declared the winner, and it doesn’t need to be a great one. The killer punch of Colin Powell’s 2003 UN presentation was actually barely felt by WPO, but as WPO stood by helplessly, the US was declared the winner. The problem lies with the two referees of the fight. One is a weedy and unctuous streak of nothing, with the manner of a Peter Lorre character. This is the UN Secretariat (the primary bureaucracy of the UN). Sometimes it defiantly squeaks at the US, berating it for biting and hitting below the belt, but it can always be relied on to ratify victory like the compliant minion that it is. If this seems overly cynical, we should remember that much the same behaviour is displayed by completely dependent puppet leaders installed by the US (such as Thieu and Ky in Saigon; Karzai in Kabul; Rhee in Seoul; Lon Nol; Mobutu; Suharto; and any number of Latin American dictators who have not been averse to appropriating anti-imperialist rhetoric to further the imperial project). Shows of defiance help build the flimsy constituencies of puppet regimes, but also lend credence to US claims that they are independent actors. This is not a jaded view of the UN Secretariat but a realistic one. To illustrate, I need only point out that there is no obligation whatsoever to be amnesiac. The UN Secretariat does not need to pretend that there was no invasion of Iraq, no bombing of Serbia, no invasions of Granada or Panama, no bombings of Laos and Cambodia. Try as I might, I cannot find that part in the UN Charter that reads: “Never mind. What is done is done and there’s no use crying over spilt milk.” In fact, it seems rather hollow to forbid something if, when those warnings and protestations are ignored, you simply roll your eyes. This is not the way the UN Secretariat behaves towards rivals and enemies of the US such as Iran, North Korea and Sudan whose past sins are never forgotten. Working closely with the UN Secretariat is a dim-witted giant – the UN itself. The United Nations is a collection of member states, and should not be confused with the UN Secretariat. In practice that means that the UN is the governments of those member states. Collectively they make up this lumbering moron that is quite resentful of the US but far more afraid of it. The confused ambivalence of the UN makes quite a contrast with the clarity of WPO. In theory, the UN should reflect the WPO and be in the WPO’s corner. It should untie the WPO’s hands, and then the US would never even dare step in the ring. If the UN had the clarity of the WPO then its fellow referee would be forced to concur on its decisions. But the UN is ensorcelled – rendered stupid by the glamour of meaningless baubles and flattery while genuinely fearful of the unpredictably psychopathic US. The question of the moment is whether the UN is starting to think that the WPO might also be dangerous, and perhaps rethinking its allegiance. I am going to abandon the boxing analogy now, but I must ask why the US feels compelled to go up against WPO. It is not merely some whim, nor a clash of personalities, nor a money-making scheme for Raytheon. Morevover, Obama and Kerry are utterly incidental – as Tony Cartalucci details, specific plans to foment armed insurgency in Syria were set in motion in 2007. 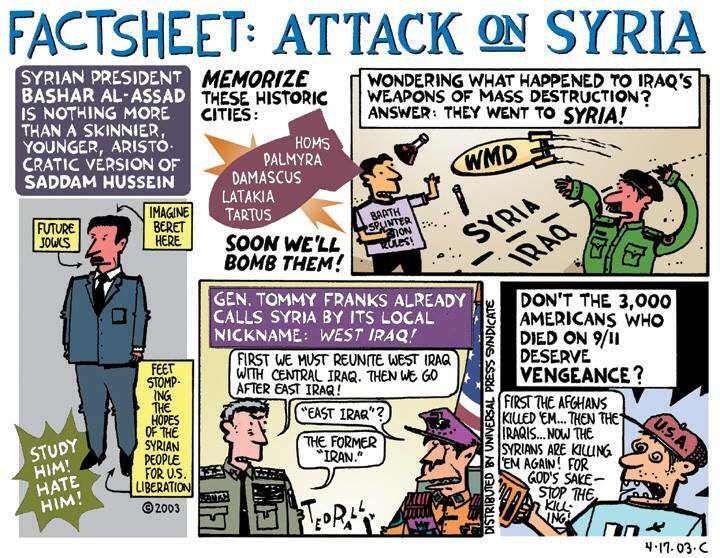 Before that Syria was on a “hit list” of 7 countries dating from 2002. There is also no truth in Washington’s claimed motive of humanitarian concern and a self-declared “red-line”. Many, including John Pilger, have pointed out the sheer breathtaking hypocrisy of citing humanitarian concerns by a power which remains, in MLK’s words, “the greatest purveyor of violence in the world”. Others have been specifically enraged by the Obama repeatedly citing the “norms” against using chemical weapons when the US has caused such immense amounts of death and suffering with chemicals such as Agent Orange. For example, Wesley Messamore outlines 10 mass death causing chemical attacks conducted by the US, with US approval, or with US assistance. In short, US pretensions of humanitarian concern and righteous outrage are a bald-faced and contemptuous deception. Equally, the evinced concern for US credibility is no more than a twisted joke. As I detailed in a recent article, Obama is using language very similar to that used by Richard Nixon in 1970. He explained that the US needed to invade Cambodia otherwise people would think it “a pitiful helpless giant”. Needless to say that any President modelling his words on those of Nixon is truly scraping the bottom of the propaganda barrel. These are rationalisations only liable to persuade the most credulous, the most craven, and the most pious believers in the infallible goodness of the authorities. As indicated in the previous section, this broadly excludes the peoples of the world, but mostly includes their governments. “To your humble blogger, this is simply the next iteration of the unspoken, brutally realpolitik policy towards Syria that’s been going on for the past two years. To recap, the goal of that policy is to ensnare Iran and Hezbollah into a protracted, resource-draining civil war, with as minimal costs as possible. This is exactly what the last two years have accomplished…. at an appalling toll in lives lost. It is a dark thought, but the assertion that the US tried and failed to create stability in Iraq and Afghanistan is simply untrue. The US never attempted to create stability. After more than 12 years of genocidal sanctions on Iraq, the US by direct means did to Iraq exactly what it is doing indirectly to Syria, and in even bloodier fashion. They destabilised, they killed, they destroyed, they poisoned, they unleashed death squads and they deliberately created a civil war. As the list of “failed states” left in the wake of US direct and indirect, overt and covert interventions continues to grow; as the numbers of victims mount and surpass those of past brutal regimes, perhaps it is time for us to shed our denial over the nature of the US empire. The redoubtable Glen Ford of Black Agenda Report writes that Obama will “soon be back on the warpath, meaner and more aggressive than ever.” That may come to pass, but I am not sure that Obama needs to be more aggressive. The real danger now is that Obama successfully feigns a change of heart and in doing so finesses some form of “authorization” which may be exploited. Historically speaking when the US congress authorised the President to use force in 1964 and 2001, those authorisations were taken as carte blanche for multiple acts of aggression. Already Obama and Kerry have stated that a credible threat of force is necessary for what they refer to in Orwellian fashion as “diplomacy”. Threats of force are, in fact, illegal under Article 2 of the UN Charter, and one would not normally describe coercing someone into compliance as being diplomatic. There is, however, a relevant precedent. As Noam Chomsky indicated on a recent appearance on Democracy Now! it was the efficacy of threats of force that secured the Sudetenland for Germany in 1938. That too was referred to as diplomacy, and the Germans justified their intervention on humanitarian grounds. But John Kerry has something that Hitler never had – the Munich analogy. He actually said, “this is our Munich moment.” John Kerry gets to justify acting like Hitler by implying that if he doesn’t then Assad will be the next Hitler. If Adolph were around, he’d be green with envy. Unfortunately Rwanda before 1994 does bear some resemblance to current Syria, for all the wrong reasons. The US backed and armed an unbelievably vicious insurgency which lacked popular support. The insurgent Rwandan Patriotic Army (RPA) was better armed than the actual Armed Forces of Rwanda (FAR). The RPA inverted the normal practices of traditional insurgents who draw on the support of local populations. Instead they conducted a scorched earth, cleansing, refugee generation and mass destabilisation that centred around massacring civilians to create terror. The achieved the same thing through demonstrative atrocities that the US bombing campaign in Cambodia achieved, emptying the best farmland and creating a volatile tinderbox of frightened refugees. Genocide scholar Alan Kuperman studied the RPA and concluded that they deliberately provoked the genocide against their fellow Tutsi. (The RPA was made up of exiled Tutsi and did not scruple to massacre Tutsi themselves if they were in an area which was to be cleansed). After the RPA won, the massacres continued. The Rwandan regime became, according to the Economist “the most repressive regime in Africa”. Over 100,000 people were imprisoned awaiting trial in the year 2000. Speech crimes such such as “negationism” attract sentences of 10 to 50 years. 2 million fled when the RPA secured victory, of whom 500,000 died in neighbouring Zaire/DRC in what a UN team describes as genocide carried out by Rwanda. So there is the Rwanda analogy for you. Unfortunately I believe it only too plausible that the US sees parallels between the two situations. The US uses Rwanda as an example of the dangers of inaction but it was the US that actually blocked a Belgian initiative that would have prevented the horrific genocide. In both instances the US level of calculation and degree of control make it morally culpable for every death and every injury. The US is not omnipotent, but it is very powerful, sophisticated and subtle. It cultivates an image of blundering idiocy, just as the British Empire did before it, but it is in a controlling position. The Obama administration needs only one trigger to attack Syria. This could be an AUMF from US Congress, a “multilateral” agreement, or a UNSC authorisation. The administration will try to convince congress that it should authorise force simply to further “diplomacy”. A multilateral agreement need not be from NATO, but could be a defensive pretext involving a neighbour of Syria. The point is that any trigger could be seized upon. US aggression has not been prevented by widespread public anger, at least not directly, it has been stopped by the lack of such a trigger. If you want to know how important world public opinion is to the US empire, look at the 2003 quote from Chomsky at the top of this article. If “fear”, “distrust” and “loathing” were high in 2003 what exactly has the US done to assuage that feeling since? Fallujah? Abu Ghraib? Guantánamo? Libya? World financial crisis? The US acts with complete impunity and as per the boxing analogy, WPO has no way of fighting back. In fact it gets exhausted by the constant assaults – exhausted and distracted. Any possible excuse for the use of force will be taken much further than stated which is exactly why no one this far has given the Obama administration the excuse it is seeking. The worst would be a UNSC resolution authorising force under Chapter VII. The US clearly misused the UNSC resolution authorising the use of force to protect civilians in Libya. More striking, however, was the resolution authorising force against Iraq passed in 1990 in response to Iraq’s invasion of Kuwait. It was this that was used to justify the genocidal sanctions campaign, the invasion and the occupation of Iraq. What people might not realise is that once a Chapter VII provision is in place, permanent UNSC members can veto its lifting. That means that once such a resolution is in place, the US, UK or France can ensure that it continues indefinitely. In the case of Iraq, Chapter VII authorisation was not lifted until this year – more than 22 years after Iraqi forces left Kuwait and 10 years after Saddam Hussein was ousted. The only answer for now is to keep opposing any US action without ever letting our guard down, but it is about time that the people of the world were given a chance to fight back. We need to create actual democracies. To start making our governments act according to the wishes of the people. The fight against this war, the fight against the TPPA, the fight against GMOs, against corporate and financial corruption, against government surveillance, against paramilitary policing, against the Global Education Reform Movement (GERM), against austerity, and against privatisation – these are all fights against empire. Oddly our fight to democratise our governments and win them back from the imperial thrall (our fight for sovereignty) is exactly the same in the US itself. The people of the US are in exactly the same boat as the rest of us with only slight differences in detail. Fred Branfman has recently concluded that the executive branch of the US government is “the world’s most evil and lawless institution”. The fight in the US is a struggle to force the legislative branch to oppose the imperial executive on behalf of the people. I think, though, that we ought to view the executive branch as the visible tip of the US empire iceberg.